Your Most Memorable Chi Moment! Let's liven up these "living quarters" a bit more, shall we? As with any other game, we must have had our fair share of memorable moments in Chi. Be it defeating your first Morning Star, HPing your first SR+ card, standing in awe of the sheer amount of damage L666 High Wizard deals you... or anything else, really! Look at the skills activating! Look at the tiny sliver of HP the High Wizard had left! But alas, that wicked bolt of levin knocked her out in spite of the steadfast bravery and unrelenting resolve she had displayed before the abomination. That said, it must have been a truly memorable moment for her, although she must have had experienced things way more interesting than this! So, we'd like to hear from you, you, and you, every one of you: what's your most memorable moment throughout your Chi career? Remember, it doesn't have to be positive experiences; negative ones count as well! Or you know, just about anything that, upon happening to you, left such an impression that was burned into your memory, and thus have lingered until right now and been refusing to leave. Come, share away and let your experiences be heard! I still remember being absolutely floored back in the public beta when I fought the first Large Body. "How am I supposed to fight this?! "​ or some such reaction. The time when Subspecies was just released. Boss missions to defeat 5 x Behemoth Subspecies above Level 45, and 1 x above Level 65. During this period, many parties formed alliances, mine as well. When we met a formidable opponent, we set up chatrooms, a community board, battle strategy sessions on how to handle it. 19 hours non-stop were spent to clear the above missions, out of which at least 6-10 members from each team stayed throughout. 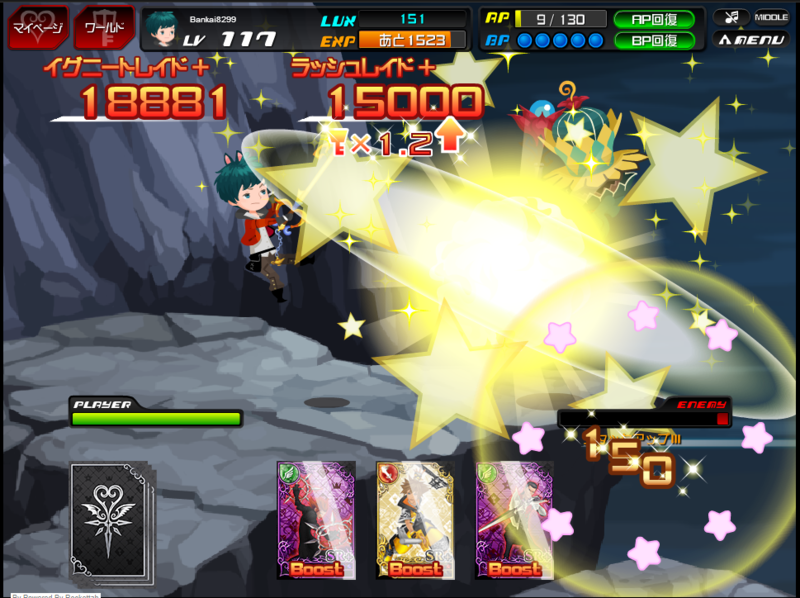 A constant continuation of the chain count, ensuring all bosses are defeated despite the time (back then a failure to defeat will decrease the boss level). Even the top teams took till 7PM to clear their missions. Level 95 Behemoth Subspecies, an almost impossible task. LC'd my Xion SR+ with another LC'd Xion SR+. Most horrible moment. Memorable. Memorable. P.S. : Still have not HP'd that card until today. Too scared to touch it again. My scar would hurt. the other times we faced them, we were defeated miserably. I'm in Ursus #6. It was during the White Day event. Remember the White Chocolate Statue? Yup, those L555 ones. That was even before the Morning Stars first made their appearance, and the WCS are the strongest field Heartless in their time. I coveted the Repliku SR that was available as a reward for killing one of those things, which was a near-impossible feat back then for me since I was just a spring chicken. It hadn't even been a month into the game for me! I asked my team members how many Potions they had required to kill one. Even the strong ones back then said that they had spent around 20 to 30 Potions to kill one, at which I was pretty much bedazzled. But I didn't really care. I wanted that card, so I gathered 100 Potions and tried killing one. And it was hell. The amount of damage it dealt me with one hit of its strawberry spear was just obscenely, ridiculously high. I remember it was in the hundred thousands while my max HP was only around the 40k or 50k mark. I only dealt little damage, but tried again and again until I finally defeated it, and was really surprised that I "only" needed less than 50 Potions for the feat. I was really excited back then as I was actually stronger than I thought, haha. That card is now no more, but I can still remember the struggle, sweat, and blood involved to claim it. For me it was the Christmas event. I went through sheer hell attempting to max out as many mission lines as I could. That meant having to try to take out those damned trees. It was worth it, and i've grown so much stronger for having that determination, but I shudder to think what awaits me this year. Does anyone remember the Pumpkin Soldiers LV300 and LV444 (40AP and 50AP) from Halloween event? Impossible to defeat in an attempt only (because at the beginning if you were defeated there wasn't the opportunity to continue the battle). Or summer missions who asking to defeat Heartless in certain worlds (example: "Defeat x Big Watermelon in Wonderland" or "Defeat x Fireworks in Agrabah")? in those events I could not do much because I had a few HP and the battles against the enemies did not last long, but at least I got 2 of the 3 (?!?) YuRiPa SR cards and in the event of Halloween I could only defeat the Pumpkin Soldiers LV100. I have found the definition of despair. Look at that Sliver of life that High wizard has! I spent 16 potions on this guy! Yeah it were 3, i remember coz i went through the same hell as you, was worth it though. 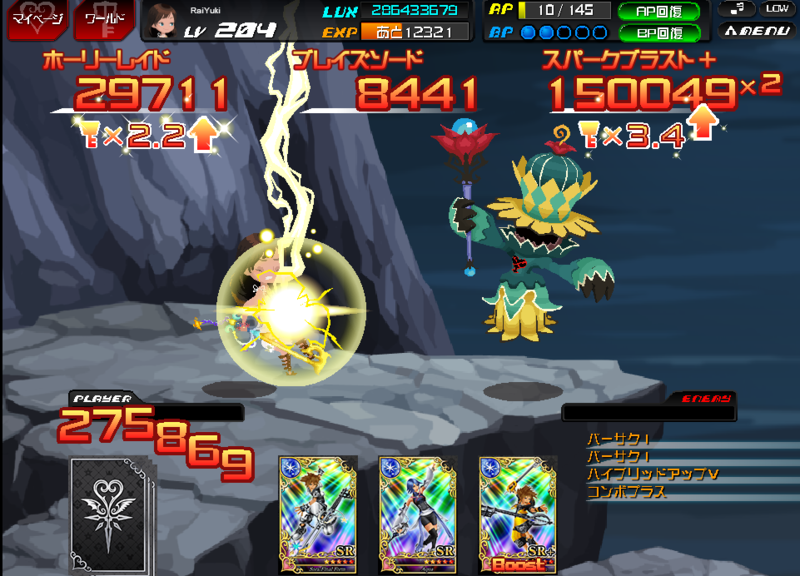 Just had my Xion SR+ hit for over 100000 damage. That is awesome. Talk about over 100k damage, the beast card is AWESOME! Achieved today killed my first 666 high wizard XD! Finally my luck turned around!